"Let's have an easy year in the garden", we said at the start of 2017, "no new projects - just consolidation of what we have already done". So why is it that it only takes one bottle of red and two glasses before one of us utters those words which fill the other with such dread - "I've just had an idea ..." And when those words are followed by " ... you may not like it", then that dread is intensified. 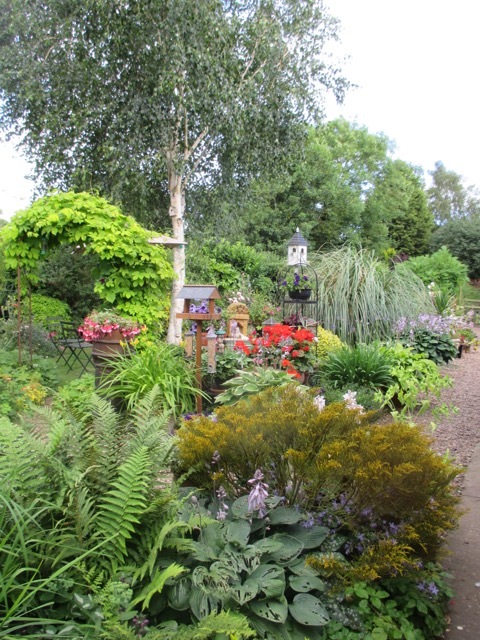 Every garden must have those areas which never really worked, where form or function is unclear, or where they have evolved into something which is, as my grandfather used to say "Neither nowt nor summat". Our garden, to be fair, has many of these areas, and we bumble along with them from season to season, always meaning to do something about them, but never quite getting round to it. Small scale attempts to improve them can be a bit like rearranging the deckchairs on the Titanic, as problems are ignored and not solved. I blame 'The Idea' which birthed last last, on those pesky garden makeover shows. We were watching a programme where Monty Don advised rookie garden owners on how to have Kew outside their own back doors, and then they worked 24/7 to get everything completed before he came back to inspect it. There was something so pristine about these shiny new gardens that was instantly appealing. There were no broken pots behind the shed, or sickly roses receiving intensive care, no wonky benches or half eaten dog toys. No gates held shut with string, or rusty obelisks. Everything was new, clean and sleek, and there were no corners of shame. In one garden there was something which we both instantly coveted, shameless consumers that we are .... an outside sofa. A great big beast of a thing that two people could lie down on and read their books and drink their Pimms or have a joint snooze in the heat of the day. We completely overlooked the fact that in all these years the number of summer afternoons spent reading/ snoozing in the garden can be counted on one hand, as we are always weeding/ mowing/ deadheading. Suddenly it seemed possible that if we only had this wonderful sofa then life would be different. Further down said bottle of red, we had already metaphorically bought the sofa and now needed a suitable place to put it. That was when 'The Idea' was born, and the suggestion was made by one of us (not me!!) to totally remodel an area of the garden - involving a shedload of hard work, new planting, trellis, arch, gravel, pots and, of course, the sofa. We decided to enclose an existing gravelled area of the garden (shown in all the photos), using bamboo and trellis as a screen, so that it is an entity on its own, entered through an arch and left via a gate. This area is defined already to some extent, so it wouldn't need much to complete it, and it is a real south facing sun trap, totally underused at the moment. It is bordered on one side by the greenhouses, and already has mature planting on another side. There are three small, shaped bay trees and a trellis covered in Clematic Armandii and Rosa 'Alberic Barbier'. Although a little, let's say, exuberant at the moment, this could be brought back into line fairly quickly with a sharp pair of secateurs. 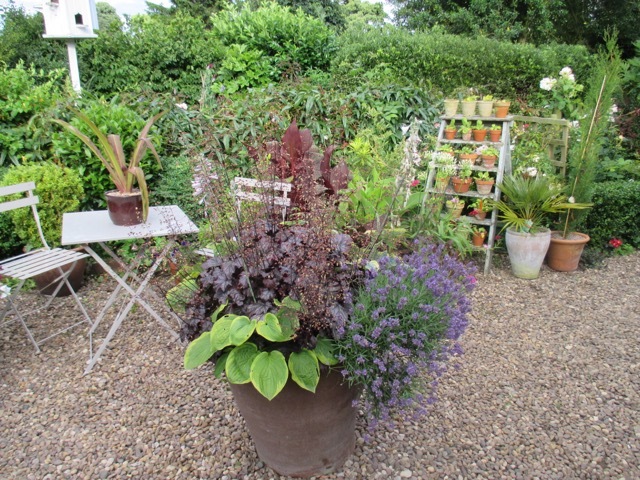 At the moment, this area is my go-to place for depositing sickly plants, pots that are past their best and bags of compost. The area has never been quite right, and has never really worked. We have had a little table and chairs there, which have been used only rarely and I'm not quite sure why. 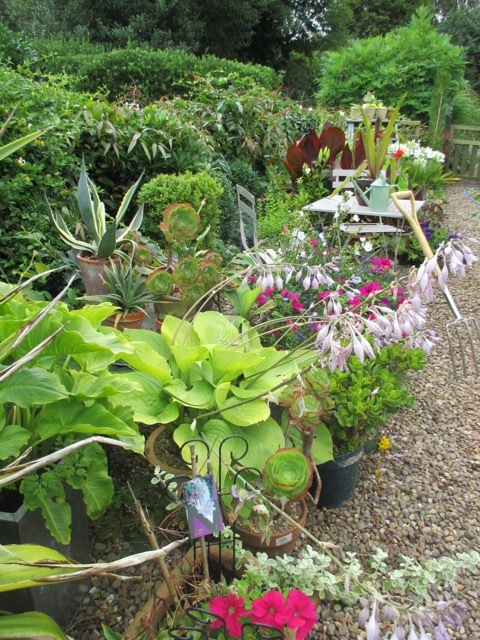 There are some pots there, but these include lots of small pots, full of finished bulbs, or cuttings I am growing on, so are not really worthy of display. 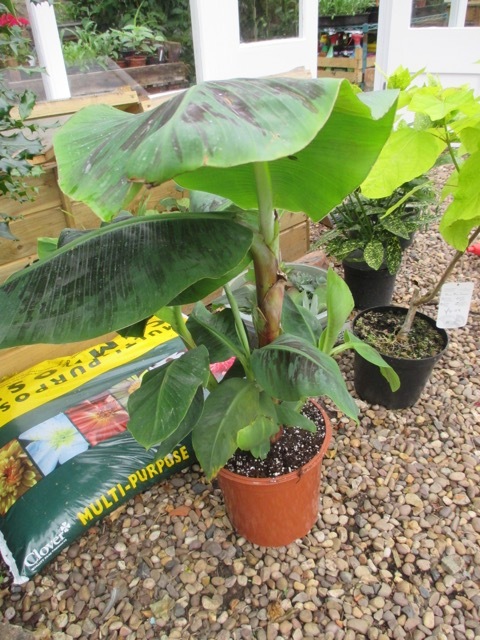 Our new project is to cut down on the number of pots and just have a few large ones, with 'hot' planting of dahlias, cannas, coleus and Ensete bananas, for example. We want the plants to be large and bold, so that they really make a statement, and to be grouped close together, and tiered to give height. The sofa would be positioned in a very private corner of this area, and a table would turn it into our main sitting and eating area. The area would lend itself well to being made more defined, and enclosed, turning it from somewhere we just go through, to somewhere we would enjoy spending time in. In the cold light of day, and two aspirins later, we are both keen to go ahead and do it, albeit on a more limited budget. Half of me loves a new project to plan, and the other half is wondering what happened to the 'easy' year we originally planned. Our 'key warning phrase' is, "I've been thinking". There's no such thing as an easy year in the garden. That phrase never bodes well, Sue! It always signifies lots of work, and probably some expense. I love love love this post. You have hit this time of non-gardening right spot on. When we sit around lubricating our senses these lovely "projects" so much easier come to light. Best of luck with your makeover. It sounds awesome. I can't wait to see it and the process...do tell. Hi Jane, it sounds like a wonderful project. 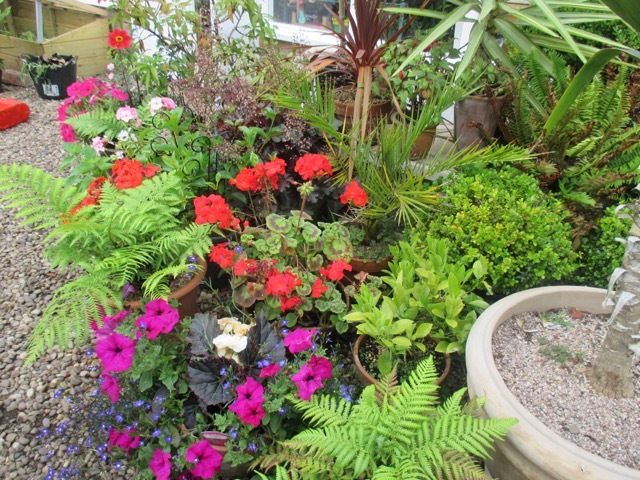 Even though I have to say that on your photos the part of your garden that you are trying to improve to me looks like it is coming right out of a garden makeover show in the after shots! You Brits always have so high standards! By the way, consider yourself lucky to have those "pesky garden shows". In America one after the other of the good and "real" ones died and now I have to resort to watch British garden shows on the internet. Anyway, I am looking forward to follow the process as you change this garden area following your dreams and making them become reality! You are too kind Christina! We are lucky in the uk with our gardening shows , even though I do still grumble about them, and shout at the tv. 'Gardener's world' is the main one, really, and is due to start its new season on 10th March. How sad I am, knowing the date, and looking forward to it!! An easy gardening year - heigh-ho... It sounds like you two will need the sofa for recuperating, but I have no doubts the results will be lovely! We need to use our outdoor areas more, so any good ideas on how to jump-start that will be carefully thought about! I hope the sofa isn't too comfy, otherwise there may be very little actual work done ! Do share your project too! Good luck with your new project Jane. It sounds as if you're not content resting on your laurels. 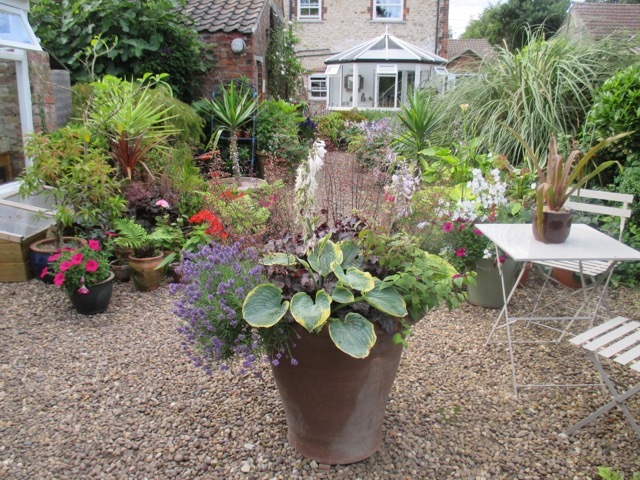 Your present gravel area, seating and accumulation of pots looks brilliant to me. I've coveted garden sofas too but there is always a practical consideration that rears its ugly head and prevents me from acting on impulse i.e. what happens when it rains? Will said sofa get soaked if there are no garden fairies on duty to take it under cover? Thanks Anna! The outdoor sofas supposedly need no fairies, as they can stay outside all year and are waterproof, frost proof, snow proof ... sounds too good to be true! A shared vision and well stocked wine cellar are key. Lead on! Wine ... check sofa .... check job done !! Is there such a thing as an 'easy' gardening year? I think we know the answer to that one Jessica ! Even the ones which start off gently gather a horrible momentum all of their own as the season progresses! Fantastic! I already like the area you are going to change, but you see it with different eyes! I like the sound of your project and will look forward to seeing the results in the future. I keep saying we will have a year without any changes, but it never seems to work! I think we gardeners like a challenge Pauline ! We don't really want an easy life at all ! Oh dear, those dreaded words 'I have an idea'. My place for contemplation/thinking? Is a recliner in the summer house! Recliner in the summer house sounds like an excellent plan! But we all love a new project don' t we? How can you resist such an exciting idea? What fun you will have. I' ve never heard of outside sofas, I' m off to do some research. Ah, thank you! Playing in the garden is half the fun! I've just watched the said programme and think of all the make-over shows these are at least realistic as the people do the work themselves with just a little push from Monty - and who wouldn't want Monty in the background, coming to prune those trees you were scared to touch or to rein in your ideas into something just a bit more realistic. Outside sofa are 'big' here in Italy although I think only tourists actually sit in them. 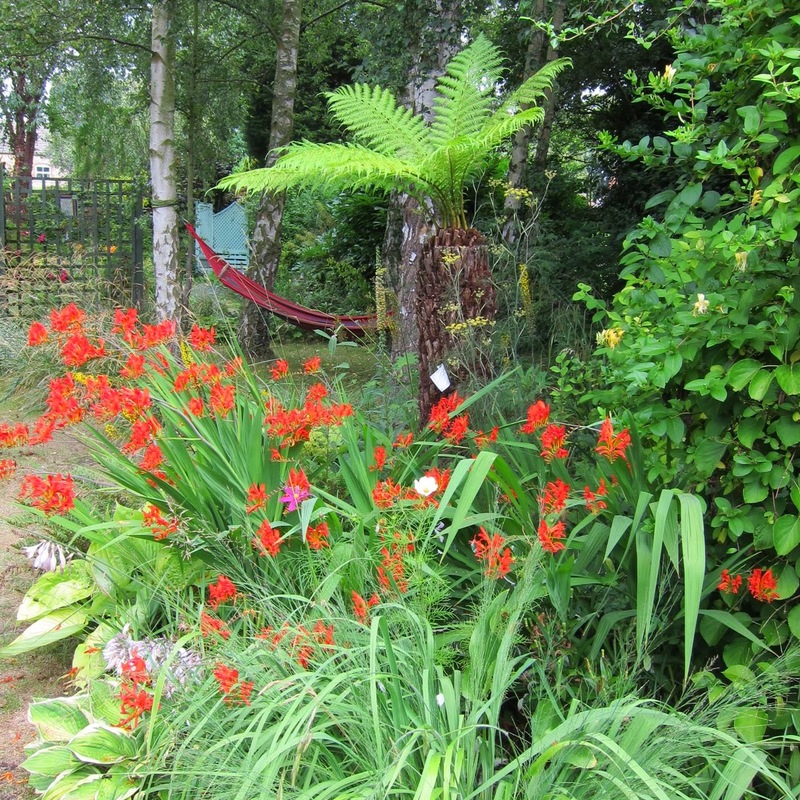 Your area looks ideal, the gravel and existing planting mean that there really isn't too much to do - go on, have fun! I agree Christina, at least the hard graft is done by the people themselves, not hired in professionals. Monty only has to raise an eyebrow to get them to rethink their plans!! Your post reminds me about my own corner of shame. I need to watch one of those shows to get some ideas! Thanks Tatyana - I have a theory that every garden has its corners of shame! Napping on the sofa sounds ideal! Ah, the ruins ... very tempting but I don't have a spare £20,000 to spend on brick walls ! I am enjoying the series too, especially the way a lot of the gardeners are totally enthused and work ridiculously hard to finish their projects. Great post, and very entertaining. I'm a very restless gardener, always wanting changes and new projects - with or without tv shows. Looking forward to see how your project turns out. Thanks Jason. 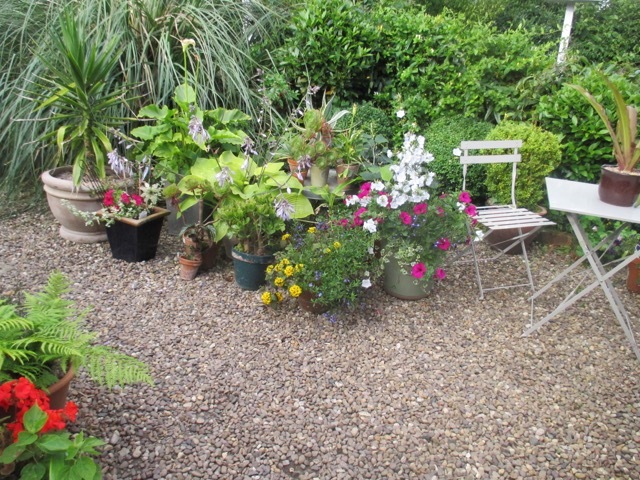 I am a reluctantly restless garden, always intending to take it easy in a deck chair, but never quite making it ! I have started logging my gardening hours. So far since last June it is running at 16 hours per week and it does not include blogging or drinking wine in the garden! Hmmm! It is the 'drinking wine' bit which would escalate the number of hours for me !! Have your hours declined in the winter months Steve, or do you go our there come rain or shine ? Thank you Linda ! Sunshine is much needed at this time of the year ! Greetings to you too!